Actively feeding supermassive black holes at the centers of galaxies are messy eaters. They accrete material from their immediate vicinity, and as this material falls towards the black hole it forms a thin, rapidly spinning accretion disk due to the combination of gravity and rotation. Material in this disk revolves faster and faster as it gets nearer to the black hole, and, before it reaches a point of no return, grows hotter and hotter until temperatures rise so high that it emits high-energy X-rays. Because of the rapid rotation of this material, and strong electromagnetic forces generated by the electrically-charged particles in the disk, some of this material escapes from the disk and forms a powerful, tightly-wound beam of particles and radiation which shoots off into space for hundreds of thousands of light years or more. X-ray images by the Chandra X-ray Observatory have now shown in detail how the hot jet from an active galaxy interacts with nearby material. 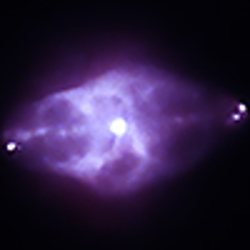 The image above is a multi-wavelength image of the region near a galaxy called Cygnus A, showing X-ray emission in purple and optical emission in red, green and blue. Bright X-ray emission from the accretion disk around the central black hole is seen as the intense source of X-rays at the center of the image. The X-ray emitting particle beams can be seen as narrow bands of X-ray emission extending to the left and the right from the black hole. Chandra's high-definition X-ray cameras allow scientists to study the twists and turns of the X-ray beam in detail as it interacts with the surrounding environment. A reconstruction of the path of the X-ray emitting beam shows that it bounces off a gas cloud (seen as "hotspot E" in the figure above) and ricochets off the cloud like a stream from a garden hose hitting a wall. The ricochet blasts a narrow tunnel in the cloud, between 50,000 and 100,000 light years long and only 26,000 light years wide. Finally, the diverted jet lights up another gas cloud (labelled "hotspot D" in the figure). Studies such as this are critical to understanding how the supermassive black holes at the centers of galaxies provide energy and matter to the intergalactic medium.